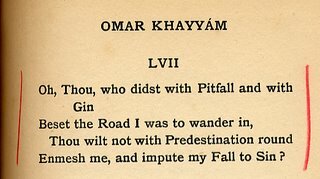 One of my mother's treasures was not a first edition of Omar Khayyám's Rubáiyát rendered into English by Edward Fitzgerald. She would have never been able to afford one. She had (and I inherited it) an early edition that incorporated Fitzgerald's first edition and his revised second edition. 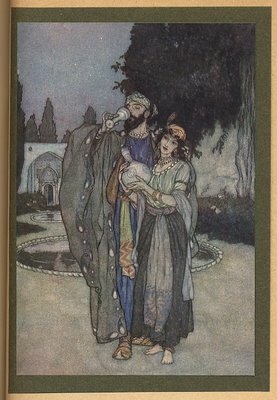 Noted illustrator Edmund Dulac did the fine illustrations which are pasted on to the this Hodder and Stoughton edition. My father had a fondness for gin. There were countless nights where I heard him promise my mother that he was going to stop. There was a particular quatrain (as the verses in the Rubáiyát are called), quatrain LVII of the first edition, that hit a chord with my mother. Perhaps she read it out loud to my father. I don't know. I do know that the page has two bold red pencil marks on either side. 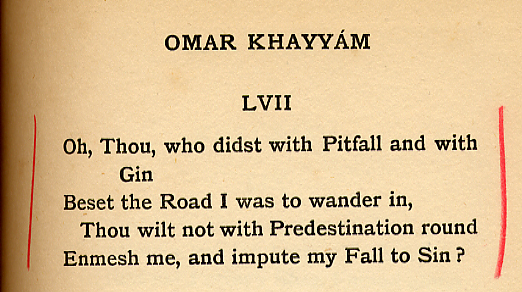 My mother died in 1972 and in 1973 I discovered a Penguin edition of the Rubaiyyat (note that the accents are now gone) that was listed as: A new translation with critical comments by Robert Graves and Omar Ali-Shaw (a noted Sufi poet and classical Persian scholar). It seems that my mother's beloved book had been a "transmogrification" (Fitzgerald's own word) of a 15th century Oxford manuscript. It was not not the earliest version of the famous Sufi work. An authorative 12-century version had been available to Sufic students in Afghanistan shortly after Khayaam's (note new spelling) death more that 830 years ago. I was startled to read side by side comparisons and I was upset to find out that Fitzgerald had even used Arab/English dictionaries in a straight literary meaning of the word fashion for his work. The real meanings of the quatrains in Graves's translation, while not having the aura of romance, had in some cases a completely different meaning. By marriage with this daughter of the Vine.